Finds Nuclear Weapons Materials Released to Landfills Pathways Open for Reuse and Recycling. Read the report written by D’Arrigo and Mary Olson of NIRS, Out of Control — On Purpose: DOE’s Dispersal of Radioactive Waste into Landfills and Consumer Products. At the top of the interview, D’Arrigo says learning that a low-level radioactive waste reprocessing plant was close to her home in upstate New York ignited her concern. D’Arrigo now assists people throughout the U.S. who want to prevent new nuclear waste dumps from being built in their communities. She clarifies the difference between low-level and high-level waste, and how low-level waste can be concentrated to become as toxic as high-level waste. Dr. Caldicott tells listeners about her visit to the office an ill-informed Congressperson whose district included a radioactive waste plant. of strontium are now migrating toward Lake Erie (one of the Great Lakes) and already polluting creeks in the vicinity. She says there is no certainty the waste site will be cleaned up. D’Arrigo explains how waste is processed, and attempts to force corporations owning the waste site to safeguard leaking trenches. She next teaches listeners about the life-spans of the radioactive elements comprising nuclear waste and how they affect the food chain and the human body. Dr. Caldicott moves the conversation to the nuclear waste reprocessing situation in Tennessee. D’Arrigo articulates how the state allows unlined trenches as burial sites, and how certain agencies are attempting to remove restrictions against releasing waste into the regular garbage supply and into consumer products. Dr. Caldicott is aghast to hear about two incinerators at Oak Ridge, Tennessee which burn radioactive waste, posing a grave health threat to nearby towns. Burning the waste will not destroy the radiation. D’Arrigo says communities throughout the U.S. have invariably prevented radioactive waste incinerators being built, once they know about the plans. She mentions the Studsvic recycling facility in Sweden which processes radioactive materials from around the world. Dr. Caldicott talks about radioactive waste being recycled into children’s dental braces, furniture, belt buckles, and silverwear, a topic she will revisit with D’Arrigo later in the interview. D’Arrigo talks about how radioactive waste recycled into steel products would contaminate the U.S. steel supply, and the difference between the strict guidelines against nuclear weapons waste recycling vs. the loose requirements for nuclear power plant waste. D’Arrigo cites some instances where radioactive materials have been found in metal fences and chairs and the products recalled. 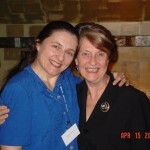 She stresses the urgency of prohibiting the discharge of radioactive materials, elements which Dr. Caldicott emphasizes are “the most carcinogenic materials ever known.” D’Arrigo explains in detail how government regulators worldwide are downplaying the health effects of radioactive waste and treating it more ever more casually. She underlines how toxic radioactivity is to all life, not just humans. Dr. Caldicott refers to Nuclear Regulatory Commission efforts to weaken regulations so nuclear waste can be processed like regular garbage and used in consumer goods. D’Arrigo gives more background on the dangers of the NRC strategy. D’Arrigo gives an overview of the radioactive waste recyling situation in Texas, as well as plans to put radioactive waste at sites across the U.S. and to move it around the planet in a “shell game” that makes money for various companies but never stops the hazards of exposing the public to radiation. Dr. Caldicott reminds listeners that radioactive waste materials only induce cancer, harm the biosphere and leave a toxic legacy for the rest of time. D’Arrigo urges the audience to take some action to contact elected officials to oppose nuclear waste based on the information in this program. For more information on the topics in this episode, visit the NIRS Web site or call NIRS at 301-270-NIRS. This entry was posted on Monday, August 23rd, 2010 at 12:00 am	and is filed under Uncategorized. You can follow any responses to this entry through the RSS 2.0 feed. Both comments and pings are currently closed.